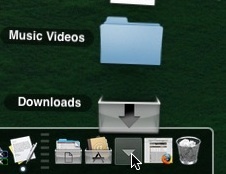 The ever changing stacks icon is a bit of a distraction on the Leopard dock. However thanks to a really smart idea and some well designed icons stacks can now have boxes to hold the contents. XD has the info on what to do using these well designed icons. Much better. Also notice the Firefox icon next to the minimized widow – a nice touch that helps identify which app is minimized. I’m sure this wasn’t in tiger. The stack when opened will show your chosen stack icon first but this actually looks pretty good, almost as if the container is shown and then the objects within.